Missed a deadline for reporting PAYE information in 'Real Time'? Blog » News & Events » Have you missed a deadline for reporting PAYE information to HMRC in ‘Real Time’? Have you missed a deadline for reporting PAYE information to HMRC in ‘Real Time’? Starting this week, HMRC is writing to employers who are PAYE-registered but have failed to submit their payroll information in ‘Real Time’ before 20th August. New ‘Real Time Information‘ legislation was introduced on 6th April 2013 which meant that employers had to start reporting PAYE information to HMRC every time they ran a payroll and not just at Payroll Year End. The letter (which you can see a copy of below) states that over 85% of employers are already reporting their PAYE in real time so this latest communication is intended to reach the remainder who are either still unaware of the new legislation or just haven’t got around to doing anything yet. RTI was predicted to cause widespread chaos for small firms across the UK but all our data and feedback shows that people using our Sage One Payroll software have found it a breeze because the reporting is done with a single click of a button at the end of each payroll run. Admittedly there has been some confusion in the market with the deadline already relaxed for ‘some’ businesses. 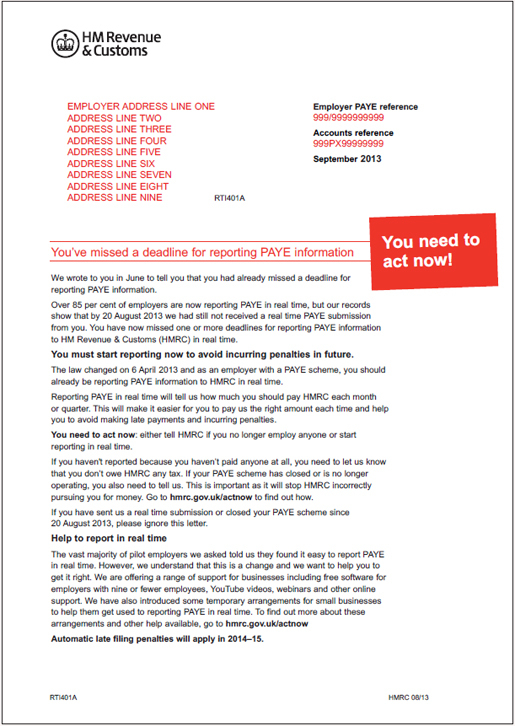 However, the message from HMRC is clear that everyone needs to start reporting in Real Time asap.